Train links from Giulianova to Teramo. Train links from Rome to Pescara on the Adriatic Line. 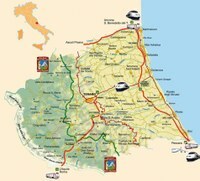 From the Marche and Umbria – You can reach the Province of Teramo from Ascoli Piceno on the State road SS 81. Regional ARPA buses (Autolinee Regionali Pubbliche Abruzzesi). Links with Rome and Naples.